Sometimes, life just tumbles over on itself, accelerating like a poorly made snowball down a bumpy hill. A few months ago, I was enjoying retirement and trying not to feel guilty for “forgetting” to mow the lawn or wondering when I might find the time to hoover the bottom of the swimming pool. Then, here I came, tossed like a pebble into the clash of cultural Titans which is daily life on this little spit of land jutting precariously into the West Bank like an unwelcome drunk at the wedding. Friction wears down the surfaces, however, much as John Kerry must have felt over the months of negotiating between two implacable opponents, one of whom would just prefer to be left alone, and the other wants them dead. Since I last spent an extended period of time here, the wall – the offensive rock to both sides – has been extended so that it becomes more difficult for Palestinian youth, fuelled by Friday rhetoric, to hurl Molotov cocktails over it – and the icon of dissent on which Western liberals so profusely scrawl their ill-conceived messages likening the ‘occupation’ to Nazism – an irony there – or, worse, apartheid. John Kerry’s aside, however much the Administration now back-pedals, gained traction among the twittering classes. The effect has been to isolate. East Jerusalem, mostly grubby and poor, was always foreign and is more so now. The West Bank broods even more darkly, cementing its cultural identities with increasingly grim-faced determination with plasterwork of brittle, mutinous resentment. Abbas, the survivor (whatever is he still doing in charge? ), has signed agreements with the hounds in Gaza, who, as soon as they gain a toehold, will elect their own in the West Bank, when “currently diluted for political reasons”, some of their original Articles of Covenant may well find a ready and willingly gullible audience. I am tired. Tired of dissecting out the lies. Tired of defending in the face of the tidal waves of misanthropic fiction in the media. Tired of defending America when she seems less and less competent to conduct a diplomatically civilised game of what is becoming more and more like chance rather than skill. How the Israelis must feel about the behaviour of their long-time ally is beyond understanding. Long ago, they must have realised that bleating to the foreigners won’t get the job done. Yesterday was Yom Hazikaron, or Memorial Day for victims of war and terror. 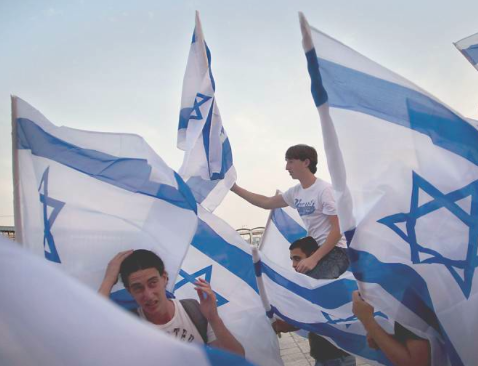 A week ago it was Yom HaShoah, or Holocaust Memorial Day, and today is Independence Day. The juxtaposition of these three events is not without significance. The last commandment of Torah, post 1945, has been, unofficially, “never again” and, perhaps more trenchant, “never stand by”. As the tiny, fledgling nation was birthed, architects of its destruction threw themselves at it from all sides, determined that it should never come to maturity. The scale of the invasion in 1948 was astonishing, their response little short of miraculous. They fought with the tenacity of survival, threw their enemies back and had the Jordanians not broken faith, the indigenous Palestinians from over the border would have had their homeland almost seventy years ago. The Israelis have long memories and there was much to celebrate last night, at least on their side of the fence. The Arabs remember this as ‘Nakba’ or ‘catastrophe’. The question is no longer ‘who’s to blame?’ but ‘can Nakba and Independence co-exist in the same space?’ They are like conjoined Siamese twins, trumping each other with aces of victimhood. 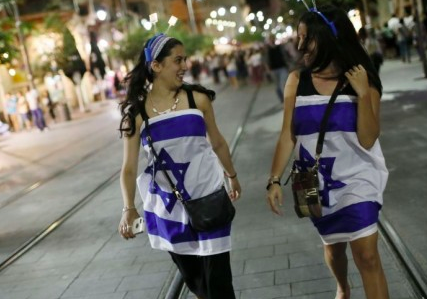 In the moment, however, the Jaffa Street celebrations overrode any darker considerations. It was good to mingle as the crowds gathered, for a party that went on all night. Teenagers with shaving foam mercifully restricted their targeting to each other. Gigantic inflatable plastic hammers emblazoned with blue and white were carried by young children who amused themselves by hitting each other with them, the irony of which reminded me of Isaiah 2:4. I flitted like a wraith, unnoticed amidst the optimism and celebration, simultaneously at home and a stranger.